Youth from 12 counties where Prairie View A&M University’s Cooperative Extension Program in the College of Agriculture and Human Sciences provides family and consumer sciences and 4-H and youth development programming participated in a health summit training as part of two nationally funded health initiatives focused on curbing obesity. The focus of the health awareness initiative is to promote healthy living choices and physical fitness importance thru our youth voices as part of the solution. The 2013 Career Awareness & Youth Leadership Laboratory was held on the campus at Prairie View July 9-10. The Cooperative Extension 4-H & Youth Development component in conjunction with UnitedHealthcare, Walmart, Houston Livestock Show and Rodeo, and San Antonio Stock Show & Rodeo sponsored the event. Participants were trained from the use of a Choose Health: Food, Fun, and Fitness (CHFFF) curriculum designed at Cornell University which included sessions on veggies and fruits, whole grains, nutrition fact labels, sweetened drinks, fast food, and eat breakfast. The participants were encouraged to find creative, alternative methods to convey healthy information and ways to help their communities best understand the importance of healthy living. Both funders, UnitedHealthcare and Walmart, of this national health initiative are very much interested in empowering youth voice and youth choice into how we deliver curriculums and programs related to health importance. “We were thrilled to have 132 youth, ages 13-19, participate with over 30 caring adults from their respective communities to develop professional public speaking, classroom management and leadership that are essential job skills for making presentations as Health Ambassadors,” said Dr. Rukeia Draw-Hood., program leader, 4-H & Youth Development, Prairie View A&M University, Cooperative Extension Program. Extension Agents are actively recruiting youth ambassadors to participate in service learning projects by reaching out to science classes, health clubs, and other youth organizations that are interested in participating in a national initiative. For now, communities should look out for the outreach efforts from this initial trained group of youth in their county to speak up and speak out for healthy living in their creative youth voices! 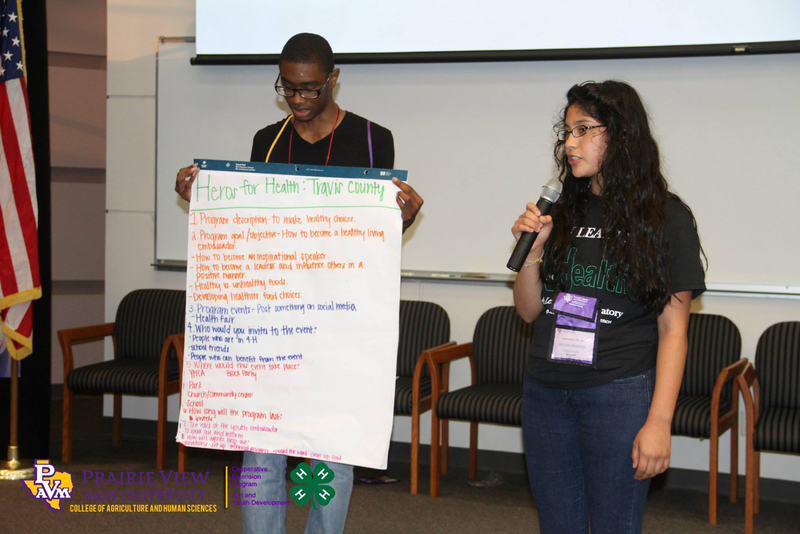 For additional information about the 2014 4-H Career Awareness and Youth Leadership Laboratory or Youth Ambassadors Health Initiative, interested persons may contact Dr. Draw-Hood at rdraw-hood@pvamu.edu or Dr. Roberson at sgroberson@pvamu.edu or visit Cooperative Extension on Facebook at http://www.facebook.com/pvcooperativeextension. This entry was posted on Friday, February 7th, 2014 at 5:39 am and is filed under 4-H & Youth Development, Cooperative Extension Program. You can follow any responses to this entry through the RSS 2.0 feed. You can leave a response, or trackback from your own site.